One has to begin to react to these Boston Celtics. After cleaning up the Cavaliers in what very easily could have been a 5-game series, then traveling to Orlando to steal home court in game one (1), at what point do we begin start to mutter the words Banner 18? The proper game plan to neutralize Dwyane Wade in their first round series. A calculated blow to the coronation of King James in round two (2). Now with a 1-0 lead in the Eastern Conference Finals against not just a 59-win team but against the games elite center, are the Boston Celtics going to the proverbial well for one more shot at a ring? You bet. Here's why . 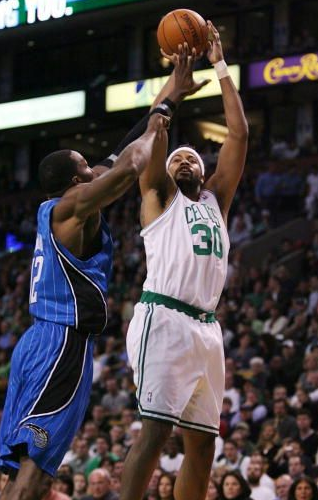 . .
As frustrating as Celtics center/forward and 14-year veteran Rasheed Wallace was during the 82-game regular season, since game 2 against Cleveland he's been brilliant. Since then the Celtics are 5-1, and you better believe there is a connection. 'Sheed is no longer the most indefensible player in the league as he was in Detroit's championship season back in 2004, but he is beginning to show signs of that chip on the shoulder player we knew and hated as a Piston! Wallace is using his fouls wisely, forcing bad free-throw shooting players like Shaquille O'Neal and Dwight Howard to the charity stripe. Wallace is scoring off the bench, three double-digit games since that round 2, game 1 performance. Why has Celtics coach Doc Rivers increased his minutes? You figure it out. Wallace is coming off the bench and putting in work, buying into the defensive scheme that has made this Celtics defense great. When Rasheed made you age 10-15 years during the regular season by his irregular play, why would any of us have expected this output during the postseason? Well Rasheed told you he'd be judged by his play in the postseason and for Wallace, it's judgement day. The everlasting commitment to defense. Through the first two rounds of the post season, against two of the leagues most dominating offensive players, the Boston Celtics are allowing just shy of 92 points per game. Against Dwyane Wade, the Celtics forced nearly six turnovers a game, doubling his regular season average. Against LeBron, the Celtics befuddled the global icon forcing him into bad shots and driving to the lane against five defenders. Now one game into the conference finals, their game plan is obvious: foul and frustrate Dwight Howard into ineffectiveness. Between Celtic big men, Kendrick Perkins, Kevin Garnett, Sheldon Williams, and the previously mentioned Rasheed Wallace (who said it himself in the postgame interview), they've got twenty-four fouls to use against Howard, and they'll use 'em all. Unlike the Hawks and Bobcats, the Celtics won't double-team Howard and give up the open three-point looks, they'll hack Howard till he's useless. There is a reason why the Celtics lead all playoff teams with forcing almost 17 turnovers a game. To boot, Boston has allowed more than 90 points in just 4 of their 12 postseason games. Seen this defense before? I have, in a title year. 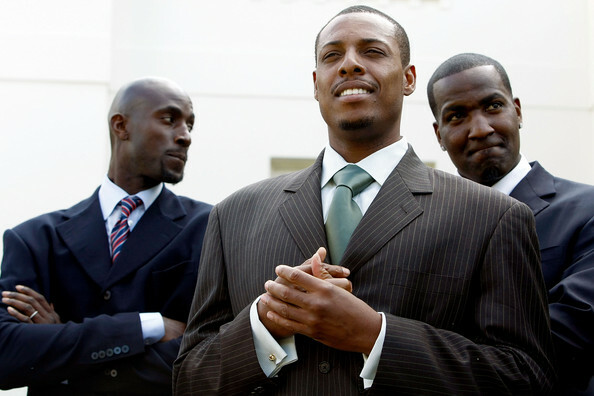 With their all-star power forward Kevin Garnett back in the middle of this defense . . .
About that All-Star. Kevin Garnett may not be the player he self admittedly once was, but he's still at times unstoppable. In these playoffs, Garnett has had 5 of 12 double-digit rebound games, but wait that's not all. Averaging almost two more rebounds in the postseason than he did in the regular season, Garnett's play all around is coming full circle. The four double-doubles in the postseason is by design. Taking the Celtics coaching staff just a few days to figure out, LeBron and the Cavaliers had no answer for the '95 fifth overall pick. 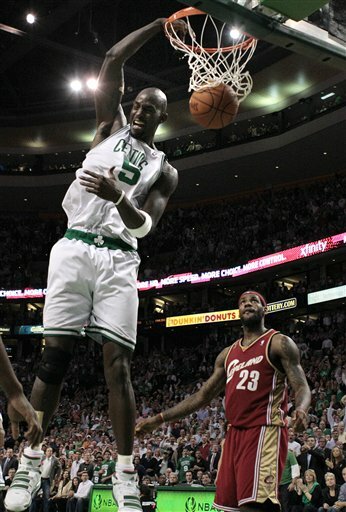 Back-to-back games with 18 and 10 then the series clincher in which Garnett shredded the Cavs for 22 and 12. Garnett's legs aren't looking as tough as they used to be, but he's making his way up and down the court with relative ease. If the 2010 Boston Celtics are going to make a lasting impression on this postseason, they've got to do so through their defensive leader, Kevin Garnett. These Celtics may have caught a Magic team with a little rust on a bit to much rest, but judging by the way they are attacking this postseason, they've made a believer out of me.